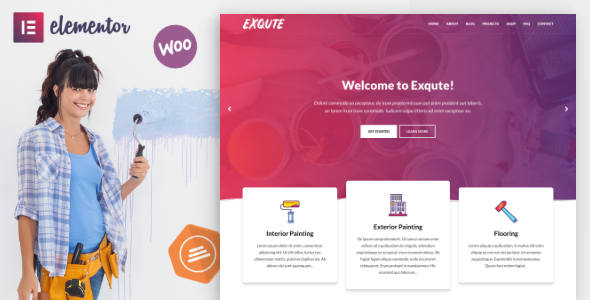 Exqute is a modern WordPress theme especially designed for painting companies and painters. Due to rich set of customization options, it can be used for any related businesses like building services, cleaning, renovation, remodeling services, interior design, construction, plumbing, carpentry, engineering, property maintenance etc. Fully responsive, modern and clean design. Customizer: Rich set of live customization options allows you to customize your theme with ease. Crafted with Elementor: Elementor is the most advanced free page builder for WordPress, which introduces a whole new visual way to design your WordPress website. Exqute comes with 9 custom Elementor widget (Gallery, masonry, carousel, post list, icon list, testimonials, accordion, button and alert widgets). Seamless integration with WooCommerce. Start selling online in 5 minutes! Projects custom post type with category support. Made with SEO and Speed in mind. One click full demo import. Translation ready. Language file (.pot) is included.